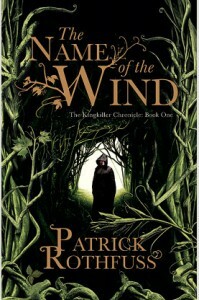 Patrick Rothfuss is an American fantasy author whose debut novel is The Name of the Wind, the first novel in the Kingkiller Chronicles trilogy. The novel begins with a man who calls himself Chronicler on a journey through bandit-infested lands. His target is a small inn in a rural village which a source has told him has a very unusual innkeeper. The innkeeper claims to be called Kote but Chronicler manages to make him admit that he was once called Kvothe – a name instantly recognisable throughout the civilised lands and the name of a man who although still young has already become a legend in his own lifetime. The Kvothe of the popular tales repeated by storytellers throughout the land is meant to be a great sorcerer, a genius, a master songwriter, a dragonslayer and the man who once killed a King. It is also said that there was a woman he loved, and a tragedy, and now he is in hiding with a price on his head. Chronicler is determined to persuade Kvothe to tell him what really happened so that the truth of Kvothe’s life can finally be known. Kvothe reluctantly agrees, but insists that he will only tell the story himself, with no interruptions, and he declares that it will take three days to tell. The Name of the Wind is the first day’s story. Kvothe’s story begins as Epic Fantasies tend to begin with a young boy with talent and great potential living a simple life with a loving family and a wise mentor. His parents are the head of a caravan of travelling entertainers, his father is a master storyteller but his latest ambitious project to write a new story based on the legends of the Chandrian, the mythical supernatural beings who according to legend brought devastation to the entire continent, brings Kvothe’s comfortable family life to an end. When travelling through a forest Kvothe’s family’s caravan is attacked by mysterious assailants, Kvothe is the only survivor as everyone else is brutally slaughtered. Traumatised by the experience Kvothe first lives off the forest for several months then finally makes his way to the huge city of Tarbean where he lives on the streets, scavenging what he needs to survive. It is a hard, brutal life but Kvothe eventually manages to use his wits to escape and get a small amount of money which he uses to travel to Imre and its famed University. Kvothe was well-educated before his family were killed and he manages to pass the entrance exam, but although he finds academia fascinating his real goal is to gain access to the University’s library to find out whatever he can on the Chandrian so he can one day get revenge on his family’s killers. Kvothe makes both friends and enemies at the University, particular enmity coming from Ambrose, the son of a wealthy and powerful nobleman who gets involved in a series of escalating quarrels with Kvothe. The University Masters are also divided in their opinions of Kvothe, he is obviously a prodigy who despite being younger than his peers is clearly one of the best students the University has ever seen. However, his lack of common sense and patience leads him into difficulty getting him repeatedly into trouble and also getting him banned from the library he is determined to gain access to. Meanwhile his lack of money means he has to be inventive if he wants to pay the necessary tuition fees. Outside of the University he meets a beautiful young woman named Denna singing in a theatre in Imre. Kvothe quickly falls in love and Denna also seems fond of him, but she also had a lot of secrets and frequently disappears from Imre without explanation. Towards the end of the novel Kvothe encounters Denna again in a rural town where both are investigating the slaughter of a wedding party that bears some resemblance to the possible Chandrian attack that killed Kvothe’s family. The story is punctuated with occasional chapters back in the Inn as Kvothe, Chronicler and Kvothe’s unusual barman Bast reflect on Kvothe’s story. The first thing to be said about Rothfuss’ writing is that is easy to read and entertaining. The prose and dialogue are both of a very high quality and both the more serious and tragic bits of the story and the more humorous or light-hearted parts of the tale are very well written. Rothfuss is a skilled storyteller and even when not much of consequence is happening in the story it is still very entertaining to read, which is a good thing since for much of the second half of the book nothing much of consequence happens in the story. The plotting is at times frustrating, although the early stages of Kvothe’s life are done well (despite being a bit clichéd at times) once he gets to the University the pace slows and although Kvothe’s escapades are entertaining it starts to get repetitive and formulaic after a while as Kvothe repeatedly manages to gain some money to pay off his debts but then loses it all and his repeated petty feuding with Ambrose seems a bit tame compared to the elder Kvothe’s reputation and his quest to defeat the legendary Chandrian. Kvothe is an undeniably likeable character but the combination of his being a genius whose talents seemingly extend to being brilliant at everything he tries to do and Kvothe’s huge lack of common sense that repeatedly lands him in trouble starts to get a bit annoying after a while. It also seems a bit unbelievable at times that someone who had lived in grinding poverty in Tarbean for several years would be so spendthrift with their money and it does start to feel like Kvothe’s repeated slide back into poverty is just a plot device to stop things being too easy for him. The framing story back in the Inn does add a bit of depth to the book as it both suggests that Kvothe may be an unreliable narrator at times and also allows for some commentary on the process of storytelling and how people’s memories colour their own story – Bast at one point comments that according to Kvothe’s story every woman he met was stunningly beautiful. The supporting characters are mostly reasonably good, with Bast and the brilliant but extremely deranged Master Elodin probably the best of the characters, but there are occasional weaknesses with Ambrose in particular being a fairly bland and unimaginative bully who with the Chandrian off-screen for most of the story struggles to be a compelling antagonist for Kvothe. Kvothe’s love Denna is also fairly unlikeable, although Kvothe is devoted to her she is manipulative and clearly lying about several important matters, this may be deliberate on Rothfuss’ part since it is not unrealistic that an inexperienced teenager might be unwise in falling in love. Overall this is clearly only the first part in a bigger tale and there is little real resolution to the novel, an extra subplot near the end with Kvothe and Denna investigating the potential Chandrian attack and then encountering a vicious monster laying waste to the countryside may be an attempt to inject a bit more action to the story but although reasonably entertaining it feels fairly peripheral and it’s frustrating that after 650 pages Kvothe is still in the early stage of his stories in the University and seems to be no closer to finding out anything useful about the Chandrian. The backstory and mythology surrounding the Chandrian is intriguing but they are still little more than mythical beings by the end of the book. In summary, The Name of the Wind is a very entertaining read but also one that could have been much better if the pace hadn’t slowed so much in the second half of the novel. When taken as a whole the trilogy may turn out to be a great story but the first book on its own is frustrating in how little it reveals of the overall tale.